13 top tips for skiing with children! A skiing holiday can be an enjoyable family holiday whatever age your children. Children aged three-plus can usually start to learn to ski. Some ski schools accept children as young as two, but even very small children and babies can enjoy the snow. Apart from skiing, children can enjoy other activities in resort including sledging, swimming, and even rides on Husky sleighs! If you decide to stay in one of our luxury self catered chalets in Saint Martin de Belleville then we can arrange all of this for you and more! Walking in ski boots and carrying skis is hard work for the best of us, let alone the little ones. Choose accommodation that will drop you off collect you from as close to the piste/bar/restaurant as possible. All of our chalets operate a complimentary and very flexible lift service to within a few meters of the piste. If your children are not at school, are at a private school with long holidays or at a primary school where they can get away with missing a few days, consider travelling during the first two weeks of January when holidays are cheap and the slopes are quiet. Alternatively, if you must take your ski trip during school holidays then Easter is a great time to come skiing. The prices are lower than February half-term and the temperatures are much warmer, meaning less chance of cold and miserable children! Make sure you and your children have all the right clothing, especially good thermal underwear and proper ski gloves or mittens. Decathlon have an online store with lots of well-priced ski clothing which is perfect as the kids will likely grow out of everything by next year! The age-old argument of whether to buy or hire rages on! We always recommend hiring skis and boots rather than buying them, especially if this is yours or your children’s first time on the snow. All equipment can be easily hired in most resorts from companies such as Intersport, and you may find you get a better discount for reserving online before you go. New for the 2018/19 Winter season are Rental Republic, a ski hire delivery service that come to the chalet to fit your ski’s and boots. The service is very efficient with in-resort ski technicians available within 1 hour, anywhere in the Three Valleys should you need a boot or ski change! Book your children into ski lessons rather than trying to teach them yourself to avoid tears and tantrums from both sides. You can always ski together in the afternoons, after ski school, energy levels permitting. We recommend New Generation Ski School here in St Martin de Belleville, or alternatively ESF are a good option if your children are already on their way to their Gold Star! Check transfer time from the airport to resort as this can vary from one to four hours. St Martin de Belleville is a 2 hour transfer from Geneva with transfer companies such as Mountain Rescue Transfers. Buggies and strollers do not work well in snow. Instead, if you have a baby or small child we recommend buying a baby carrier from online retailers such as Go Outdoors. It is now more uncommon than ever to see people on the mountain without a helmet. Almost all ski schools insist on children wearing helmets during their lessons. These can be hired in resort for a small fee. They not only protect your child against falls but also against being hit on the head by lifts and other people’s skis. Not to mention keeping their little ears warm! Take a packet of mini-chocolate bars to put in the pockets of your children’s ski jackets. The small bars are often very expensive to buy in resort and your children will thank you for the extra energy boost. Our chalets all operate an honesty bar with chocolates and snacks available at a small cost. We recommend taking advantage of these to save any hunger tantrums! Do you want to cook and clean whilst on holiday? A self-catered apartment might suit you. If you don’t mind the cleaning but definitely don’t want to cook then our luxury self catered chalets in Saint Martin de Belleville, booked together with our fab meal delivery service could be a great option for you. Want to enjoy your holiday that little bit more and take a break from daily chores and cooking? (let’s face it – who doesn’t?) Then a catered chalet holiday can be a great option where breakfast, dinner and afternoon tea will be provided for you. It also means you don’t have to lug shopping bags around in the snow! For beginners and children a ski area made up of mostly intermediate to advanced terrain won’t be particularly suitable. Make sure to choose a resort with a good breadth of terrain to keep the beginners interested and progressing nicely, but that also has enough intermediate and advanced terrain to keep the more advanced members of the party happy. The Three Valleys is practically unbeatable for its vast and varied terrain. Try to choose a resort with other activities available, for example many have swimming pools and most have sledging areas. Skiing can be tiring and you or your children may fancy a change. Before you go, check that your insurance covers winter sports. If you are travelling in Europe make sure you take an EHIC with you. Check out our handy Winter Sports Travel Insurance guide for more information. 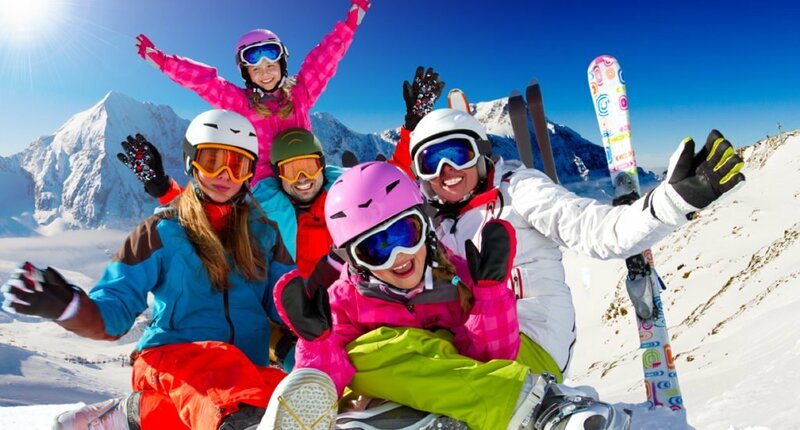 If you fancy bringing the kids away for a great ski holiday here in St Martin then check out our Easter Ski Deals for the latest prices and availability. 13 top tips for skiing with children here in the vast Three Valleys ski area!